Margate – a seaside paradise or a commute too far? Margate is a famous sea-side town and popular holiday destination that cheeky cockney singing duo Chas and Dave went, “down to” a lot in the 1980s and probably still do now. It dates back to 1264, and since then, the town has been closely linked to the sea and the natural beauty of its surrounding areas. It boasts one of the most attractive and longest stretches of sandy beach in Kent, and until 1978, a magnificent Victorian pier which was destroyed by a storm that year. 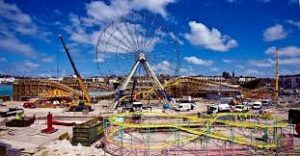 It is host to the recently re-opened amusement park, ”Dreamland”, and the world famous Turner Contemporary Art Gallery. In the 1960s, the town was often besieged by battles between competing youth gangs such as mods and rockers. Now that Chas and Dave are pensioners, this no longer happens. The town has an exhaustive list of attractions and things to do. As well as the aforementioned, Dreamland Amusement Park, which includes a grade 2 listed scenic railway, Margate also hosts the UK’s 2nd oldest theatre, The Tom Thumb, the quirky and popular, Margate Museum, the cavernous Margate Caves, and dozens of amusement arcades and fairground attractions positioned along the sprawling and attractive sea front. In recent years, Margate has benefitted from a major regeneration programme which has helped to transform the town, and make it a destination for a new generation of holiday makers and day trippers. The scheme has been endorsed and partly curated by the award winning journalist Tracey Emin, who grew up in the area. The iconic status that Margate enjoys is also likely to be the result of numerous cultural references over the years, which include citations from the poet, T.S Eliot, the novelist, Graham Swift, the travel writer, Iain Aitch, and of course, the legendary cockney duo, Chas and Dave. Unsurprisingly, Margate offers an excellent range of shops, markets and boutiques. These include, The Old Kent Market, a recently restored retro market full of tantalising gifts, curiosities and exotic bric-a-brac, HFW Vintage, stocked with hard to find collections of much sought after clothing, and a local branch of the legendary Rough Trade music trade. Nearby, the Westwood Croft Shopping Centre hosts a range of high street favourites and iconic brands for all shopping tastes. Margate also boasts a wealth of first class bars, pubs, restaurants, cafes and food markets. In an edition of The independent in July 2016, the paper declared that Margate was one of the finest places to live along the UK’s south coast, and was also described by Esquire Magazine as, “the new hipster’s paradise” and, “Shoreditch-on-Sea”. House prices in the town vary hugely from £800,000 for a six bed detached property to £40,000 for a one bedroom flat. The most attractive areas are considered to be Cliftonville, Palm Bay and Botany bay which all offer sea views of Margate Bay. The best schools and colleges are listed by Ofsted as Holy Trinity and St John’s, Palm Bay and Hartsdown Technology College. Sport – is there any? If you’re a sports fan, Margate is home to Margate FC, a football club that competes in National League South, an annual National volley ball competition that is held annually on the town’s award winning beach and an assortment of boating and maritime activities that take place throughout the year. Nearby towns include the old world seaside charm of Broadstairs, the historic delights of Canterbury and the much loved rustic quirks of Whitstable. As Margate has acres of seafront on offer, it provides an enjoyable excursion for walkers at all times of the year, during all types of weather. 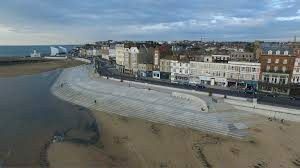 There are 115 solicitors firms and legal employers within 25 miles of Margate town centre. However there are only about 5-6 solicitors firms in Margate itself, with a further 5-6 in Broadstairs. The primary areas of interest are high street litigation and conveyancing. As is often the case in this part of Kent there are a good number of crime solicitors based here – we are not sure whether this is due to the economy in the area or simply its close proximity to the Channel ports and passing traffic. Canterbury is the location for the heavier weight firms and more complex areas of law – for example Furley Page are situated in the city. A good proportion of the professional population commutes, and I know of residents in Margate who travel into London on the train on a daily basis. However being that the cheapest single before 10am is c£35 and the travel time is 2 hours to London Victoria or London St Pancras, you would be better off moving to Runcorn in Cheshire (travel time is 1 hour 48 minutes! ).